Trick or Treat At Hide and Seek! Oh man, did I ever have the PLAGUE this week. But, it’s passing me by and one of the best ways to get over the plague is by playing gacha! I swear! And one of my favorite sims, the Hide and Seek sim, is having a Trick or Treat Gacha event! The hoodie and cute ghost t-shirt are both from the BOOM gacha. The hoodie is a “rare” find and the shirt is “uncommon,” which means you might not get them right away. The Pink Lady pumpkin pail I’m holding is from Olive Juice, and is also a “rare” find. I love it because it’s pink! In my mouth is an adorable flower basket from Awesome Blossom. I don’t usually put things in my mouth [that’s what she said] but this was too cute not to. And on my shoulder is devilish Lucikat from ANA_Mations. I love kitties, even devil kitties! If you like gacha, go go go and play out there at Hide and Seek! You have from now until the 31st to play. Don’t forget, gacha prizes make great gifts, and it’s always fun to share with friends! Here are the direct TPs to all the participating stores, just in case of lag or you want to just go to your favorite store! My older sister taught me to love thrift stores from a young age. You can always find cool vintage things if you look hard enough! The newly released Mrs. Luv coat from Jane reminds me of something awesome we would have found at a thrift store. Doesn’t it look deliciously 70s?? I’m pretty sure my mom had a coat almost just like this, but in black, back in 1979. This wrap style coat has a great thick fur collar, and a wide belt to tie in front. I wasn’t too sure about the print when I saw it on the photo, but after I put it on, all I could think was “Dy-no-mite!” It’s just too adorable!! I’m wearing Mrs. Luv in Autumn Plaid, and there is another in green plaid as well. And as everything else at Jane is, it’s extremely affordable. Go and get to shopping! Halloween Hunt For Autism Starts Monday! The Halloween Hunt For Autism begins on Monday, and I really hope all of you take part! 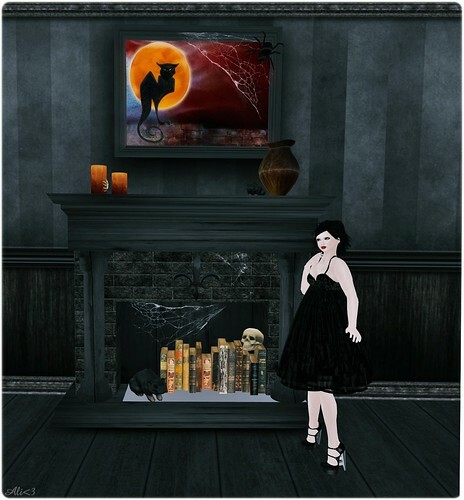 You can find fab Halloween items, such as this Creepy Fireplace Facade from Funky Junk! This hunt does require a $50L donation to get started, with the money collected going to Autism Speaks. Head to the starting point and pay your $50L. You’ll receive trick or treat bag to wear and the landmark for your next location. Be sure to wear your bag to get your treats! I believe there are 50 stores participating, but don’t quote me on that. Oh, Janie Marlowe. How we have missed you! The former Mischief designer has finally opened up her new doors with Jane! And I am SO SO happy she has, because I am in love with the new items!! I’m just so into this Aviator Jacket that I simply had to greedy pack the 3 colors. And the corresponding Aviator Sweater is just gorgeous, with or without the jacket! The new 52 jeans are simply perfect and you can never never have too many jeans. Trust me, I bought more than I’m showing here. At super affordable prices, you can’t help BUT to shop! Get yourselves over to Jane and get shopping!! Oh! And don’t forget to join the group for a great group gift! !